Drilled with a single hole and strung with a rustic jute twine or shabby chic gingham ribbon, this craft inspired decoration makes a beautiful addition to a home, garden shed or even Wedding venue. 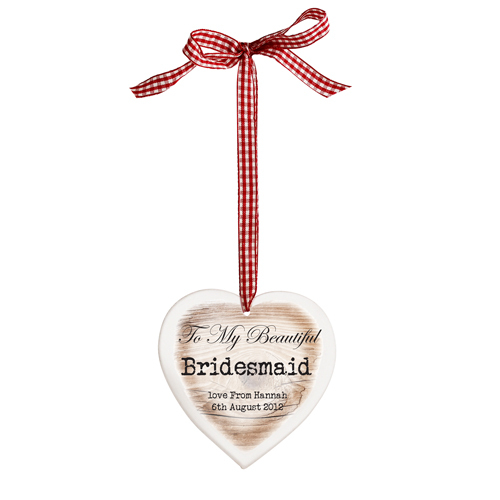 Personalise this Rustic Heart Shaped Wooden Decoration with any name at the top in a script type font up to 15 characters, a short message in the middle in the type style font up to 12 characters. You can also add a slightly longer message at the bottom of the heart of up to 2 lines of 16 characters. Personalise up to 15 characters, a message in the middle up to 12 characters. You can also add a slightly longer message at the bottom of the heart of up to 2 lines of 16 characters.